NEWINGTON - It can happen in the still of the night or the early hours of the morning. There has been a recent uptick in tires and rims being stolen off cars parked on the street, in lots or in driveways in area towns. The culprits typically remove all four tires and rims from a vehicle, leaving it on cinder blocks or bricks. The thieves work in pairs or groups and can strip a vehicle of all four wheels in as little as five minutes. Newington Police Chief Stephen Clark said about three such thefts have occurred over the past few weeks in the area north of Robbins Avenue. Newington police have been in touch with Hartford police because the capitol city has also seen a rash of tire thefts. It’s unclear where the alleged thieves are coming from, since police have a hard time catching them after the act is done, Clark said. The alleged criminals will cover their faces so they aren’t recognizable on people’s home surveillance cameras. The cars used to flee a crime scene are often stolen, which makes them also harder to track, Clark said. A group of three to four suspects will park in a neighborhood and then commit the thefts, he said. The vehicles that are primarily hit in Newington were Honda Accord Sports, Honda Pilot Elites, Nissan SUVs and Nissan Infinity’s, Clark said. The estimated value of replacing all four wheels, not including installation, is about $2,500, he added, which means selling the tires is a lucrative business for thieves. Friends of the crooks may request a certain rim and tire they want for their vehicle, so the criminals will then hit the street and go shopping, Clark said. That’s why there are cars with the rims of a different model on them, said Warren Baker, manager of Town Fair Tire in New Britain. Honda Accords are a popular target because of their common wheel size, Baker added. 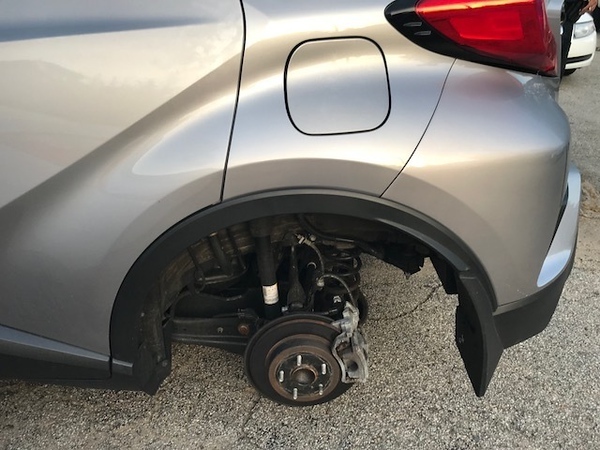 When the whole wheel is stolen, replacements have to be purchased and brought to the car for installation, Baker said, since the wheel-less car can’t be towed away easily. New model Hondas are also popular because of their design, New Britain Acting Deputy Chief Jeanette Portalatin said. The issue of tire and wheel thefts has occurred in New Britain too, Portalatin said, and her department has a unit of two detectives and a sergeant devoted to monitoring the crime. Cars on the lots of Schaller Auto World have been victim to the thefts, she said. Theft of motor vehicle accessories, a crime category that encompasses tires, hubcaps and wheel assemblies, was up 2 percent in 2016 compared with the prior year, according to the most recent full year’s worth of FBI statistics available, according to cars.com. Online market places, including: Facebook Marketplace, OfferUp, LetGo and Craigslist are where the rims and tires are being sold, Clark said. Even if a victim finds their rims and tires on social media sites, there’s often no way to identify those exact items without a serial number, Clark said. Town Fair Tire will not buy products from off the street, Baker said. Etching a VIN number on a rim, or placing a mark inside the rim under the tire is one way to add that identifying element, Clark said. Piotr Ceglarz, of Ceglarz Motor Repair & Sales, said that can be done at an auto shop or dealership. While doing it there, the shop can take pictures to provide a third-party confirmation that the rims that may have been found stolen do belong to someone else. Honda has begun to do that on some newer models in response to the issue, Portalatin said. Her department has been able to catch some suspects because of that. Another way to combat the issue, Baker said, is using a combination of wheel locks and regular lug nuts on a vehicle’s rims. That way, people stealing them will have to switch between a regular socket and the special lock socket to get the whole wheel off. Using original factory wheel locks is preferred, because they come with a specific tool to take the locks off, Ceglarz said. Aftermarket wheel locks come with a universal tool, which can be used across other aftermarket locks, Ceglarz said. Even with a wheel lock, thieves will take a regular socket and force it onto a lug nut with a hammer so it has a tight grip on it and can still turn it loose, Baker said. Add the availability of battery powered, portable tools, people looking to take the wheels can do so in a matter of minutes, Baker said. Rims could have a hub cap placed on, but that’s not common Baker said because of the additional cost it takes for the manufacturers to create one. Clark said another way to help combat the issue is with home surveillance cameras and motion sensor lights that will activate when a suspect approaches the parked car. A motion sensor detector can be purchased from Lowe’s for about $11 to $20, according to the store’s website. “Something simple like that could go a long way,” Clark said. A car alarm is one of the best things people can equip their vehicles with to prevent the thefts, and garaging a vehicle so it’s inside was another way to stop them, Portalatin said. Other tips to thwart the thieves include parking close to the curb so there is no space for the thieves to work, and turning the tires to the curb which makes them harder to remove. Berlin, Plainville, Southington and Plymouth have not had an issue with tire and rims thefts recently, police from those towns said. Sgt. Jeffrey Dobratz of Southington police said it’s cyclical when a town may experience a rash of wheel thefts, and Newington is the one getting hit now. Charles Paullin can be reached at 860-801-5074 or cpaullin@centralctcommunications.com . Have you or someone you know been the victim of wheel and rim thefts from a vehicle? Visit The Herald Facebook page and post your comments, suggestions or experience with this growing crime issue. Posted in Newington Town Crier, Newington News on Thursday, 11 April 2019 08:30. Updated: Thursday, 11 April 2019 08:32.